For 600 MW and 1000 MW power plant electric-unit, the P92 alloy steel is widely applied in super-critical main steam line or reheating steam line. It can be furnished in accordance with ASTM A335 P92, ASME SA335 P92 or its EN equivalent X10CrWMoVNb9-2. 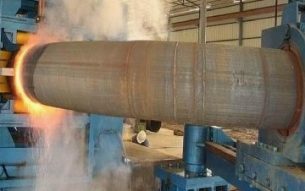 Many piping structures of the high-temperature steam line require 3D mid-frequency hot-induction pipe bends made of ASTM A335 P92 materials. The bending quality, microstructure, as well as the reliability of the finished pipe bends mainly depend on the manufacture process control. 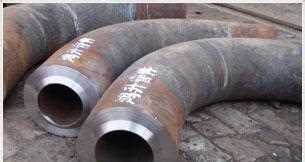 Metals-Piping has supplied 4 pieces of R=3D ASTM A335 P92 bend to a power plant project in South China. All the four pipe bends are manufactured by mid-frequency hot-induction bending machine. Although all the fittings are tested okay, due to some fine adjustment of the manufacturing processes & conditions, the finished P92 pipe bends have distinctive difference in mechanical properties. The manufacture of ASTM A335 P92 pipe bend on mid-frequency hot induction machine. *All values are in mm unit unless otherwise specified. Generally, the hot-forming temperature for ASTM A335 P92 or ASTM A213 T92 should be 850~1100°C [1560~2010°F]. Its forging temperature should be 950~1100°C [1740~2010°C] while the bending or extruding process should be conducted at 850°C~950°C [1560~1740°C]. *The allowable heating-temperature variation for B3 can be ±10°C in practice. B1 1050~1070°C, holding for 90 minutes. 750~770°C, holding for 150 minutes. B2 1050~1070°C, holding for 90 minutes. 750~770°C, holding for 150 minutes. B3 1050~1070°C, holding for 90 minutes. 750~770°C, holding for 150 minutes. B4 1050~1070°C, holding for 90 minutes. 750~770°C, holding for 150 minutes. *All the P92 pipe bends take the same heat treatment after its bending process(N+T). *All values are actually tested. Click to see the standard chemical composition requirements of ASTM A335 P92. The ASME SA335 P92 pipe bends, R=3D. *The above table shows the test results for the four finished A335 P92 pipe bends. *M.L: the hardness value at the mid-layer of the bend; *STD: the standard value specified by relative Code. You can also click to see the analysis on mechanical properties and optimum working conditions for the P92 steel in next article.